Home Our Garage Door Services Garage Door Maintenance How Do I Avoid A Garage Door Accident? Every year, many people are injured in garage door related accidents. Fortunately, there are simple things that any homeowner can do to prevent these mishaps. Here are a few simple tips on how to use your garage door in a safe way, and how to maintain it to minimize the risk of a dangerous breakdown. It’s never a good idea to leave your garage door in a half-open position. For one thing, it’s very easy to accidentally close it when you meant to open it - if a person, pet, or vehicle is underneath, the safety precautions may have less time to catch it. Getting in the habit of leaving the door half-open will also make it more likely that you’ll eventually forget it like that; this would be bad for your door and a threat to your home security! All modern automatic garage doors come with a pair of optic sensors, and many have an automatic safety lock that engages when the door encounters resistance. You should test these systems periodically to ensure you can count on them when needed. To test the sensors, place an object beneath the garage door and try to close it – if the door doesn't reverse, you know you have a problem. You can also use these objects to test the safety lock by unplugging the sensors and trying to close the door on them. 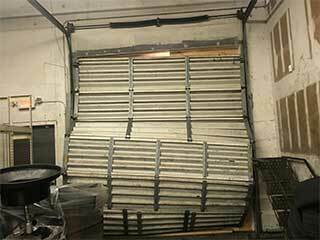 Any complicated machine that gets frequently used will require periodic maintenance from time to time - garage doors are no exception. Our experts recommend an overhead door be looked at by a professional at least once or twice per year - if your garage door is acting strangely or making unfamiliar noises, you should schedule a maintenance session as soon as possible to catch any new problems before they get serious. Watch Your Kids & Pets! Be sure to keep your garage’s controls out of reach of very young children, and to keep them away when the door is opening or closing. Even if your safety sensors and auto-lock are in good working order, it's possible for your children to injure themselves by placing their hands near the system while it's operation. If you have small children especially, you may want to replace your door panels with a style that doesn’t leave gaps big enough for fingers to get caught in. To learn more about garage door safety, or to ask further questions relating to repair, installation or maintenance, simply keep exploring our website or call us today.